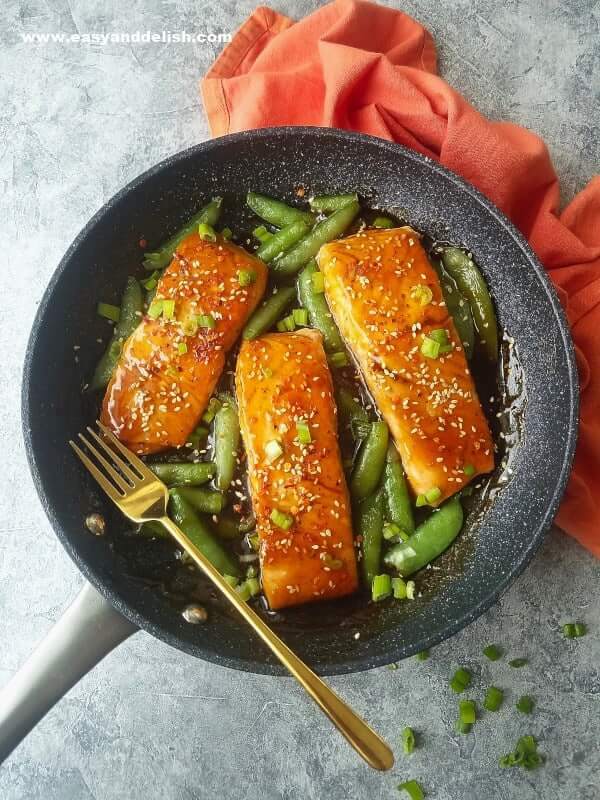 One Pan Sriracha Teriyaki Salmon with Sugar Snap Peas is a quick, easy and healthy dinner, ideal for busy weekdays. The salmon is seared, glazed with a mildly spicy, sticky teriyaki sauce, and served with crisp and tender sugar snap peas. It’s like cooking a restaurant-quality meal at home! Hassle-free, healthy family meals are top on my list. They are quick and easy to prepare and (mostly!) mess-free. This 25-Minute One Pan Sriracha Teriyaki Salmon with Sugar Snap Peas is one of the many that I love. It makes the eaters happy without wearing out the cook. If desired, serve by itself or accompanied with rice or riced cauliflower. I hope you enjoy both this Salmon Teriyaki and the time saved in the kitchen. Ready to prepare this Teriyaki Salmon? First, cook the sugar snap peas: In a large no stick skillet, heat 1 tablespoon of oil over medium-high heat. Add the sugar snap peas, and saute, tossing occasionally for 3-5 minutes or until peas are crisp and tender. Season with salt and pepper. Remove from the pan and reserve. Cook the salmon: Heat another 1 tablespoon of oil and season salmon fillets with salt and pepper to taste. Place fillet skin-side-up in the pan and sear until half way up the flesh changes color (about 3-4 minutes). Then, turn salmon fillets and cook for 3-4 minutes on the other side, or until cooked through. Remove fillets from the pan and reserve. Prepare the sauce: Whisk store-bought teriyaki sauce, water, sriracha chili sauce, and honey together and bring to a boil over medium-high heat. Then, mix cornstarch and 1 tablespoon of water until smooth (no lumps) and whisk in the sauce mixture until thickened (about 1-2 minutes). 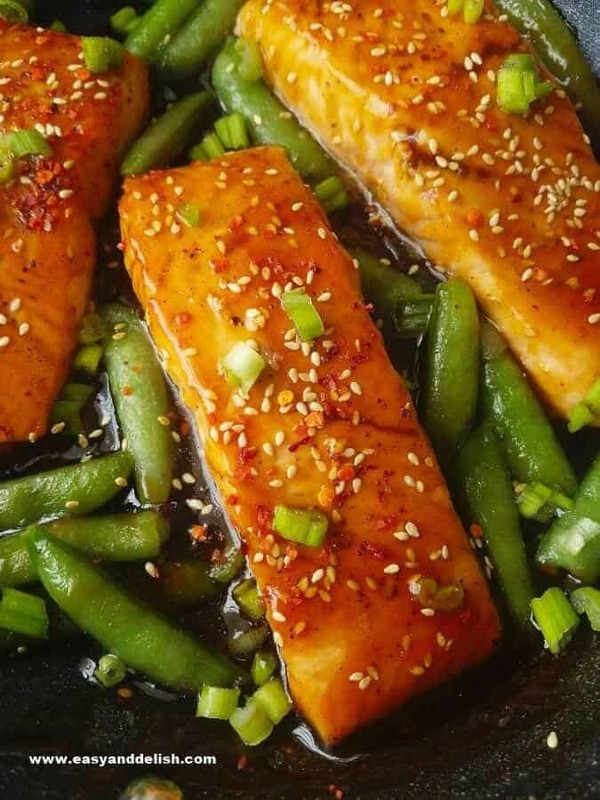 Pour the teriyaki sauce over the salmon fillets, add the sesame seeds and green onions, and serve with the cooked sugar snap peas. Enjoy! According to Wikipedia, teriyaki is a 17th century Japanese cooking technique in which foods are either broiled or grilled with a glaze of soy sauce, rice wine (mirin), and sugar. Although there are variations, traditional teriyaki sauce is sweet and is made from a mixture of soy sauce, rice vinegar, and sugar (or honey). It is boiled until reduced to the desired thickness and then used to either marinate meats or to brush them several times during broiling or grilling. Love seafood? Try our One Pot Brazilian Shrimp Stew! 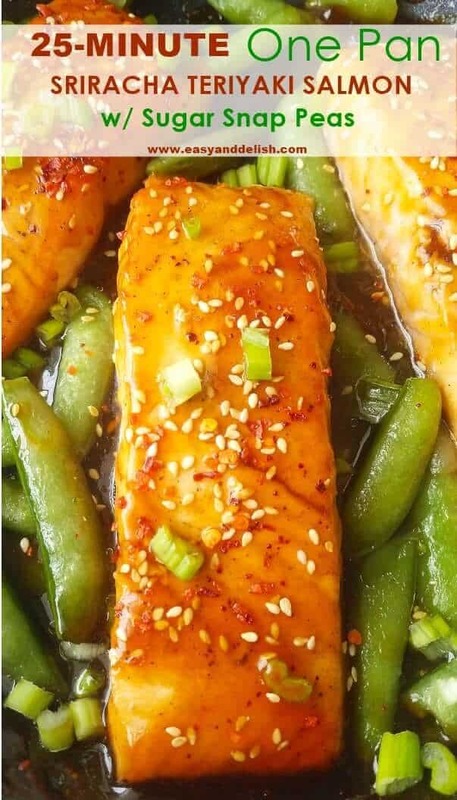 One Pan Sriracha Teriyaki Salmon with Sugar Snap Peas is a quick, easy and healthy dinner, ideal for busy weekdays. 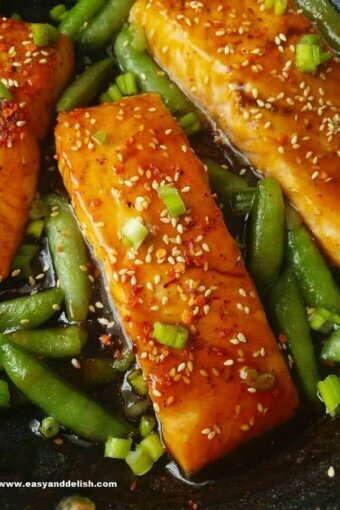 The salmon is seared, glazed with a mildly spicy, sticky teriyaki sauce, and served with crisp tender sugar snap peas. It's like cooking a restaurant-quality meal at home! Cook the sugar snap peas: In a large no stick skillet, heat 1 tablespoon of oil over medium-high heat. Add the sugar snap peas, and saute, tossing occasionally for 3-5 minutes or until peas are crisp and tender. Season with salt and pepper. Remove from the pan and reserve. 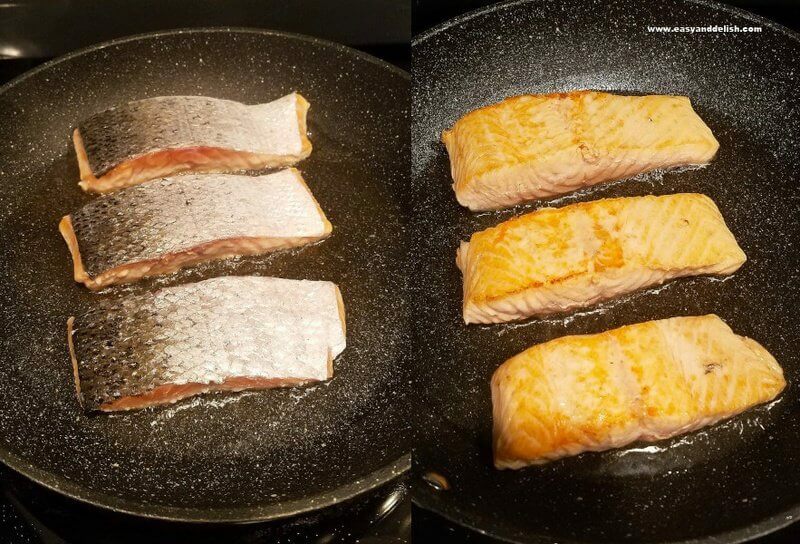 Cook the salmon: Heat another 1 tablespoon of oil and season salmon fillets with salt and pepper to taste. Place fillet skin-side-up in the pan and sear until half way up changes color (about 3-4 minutes). Then, turn salmon fillets and cook for 3-4 minutes on the other side, or until cooked through. Remove them from the pan and reserve. 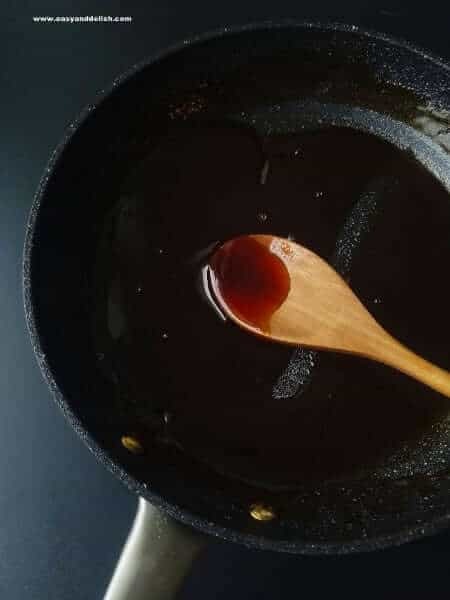 Prepare the sauce: Whisk store-bought teriyaki sauce, 1/2 cup water, sriracha sauce, and honey together and bring to a boil over medium-high heat. Then, mix 1 tablespoon water with cornstarch and whisk in the sauce until thickened (about 1-2 minutes). If desired, add 1-2 teaspoons rice vinegar to the sauce to make it less sweet and give it a touch of acidity. Love seafood dishes? Try our One Pot Brazilian Shrimp Stew. I just brought home salmon! This tasty recipe arrived just in time for tonights dinner. Love the color of this! And I’ll bet those sesame seeds add a ton of flavor. Neat dish — thanks. Thanks Jeff! It was so good that my husband, who doesn’t care for Salmon, ate it and enjoyed. 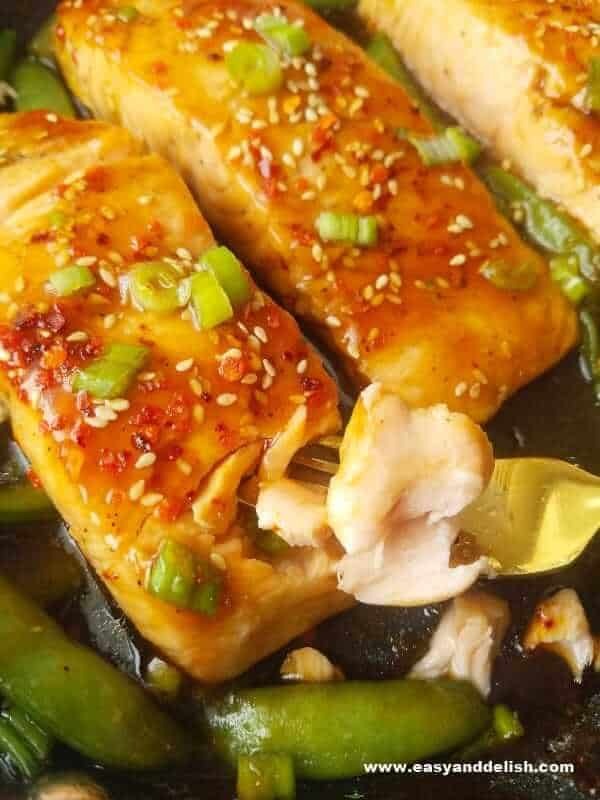 This looks absolutely delicious, Denise, your pictures are making my mouth water, and the teriyaki sauce sounds a great addition to the baked salmon!! 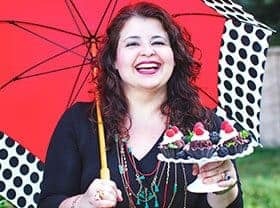 Thank you Hadia! It was a quick meal that turned out more delicious than I have expected.